It has become a frequent problem in the last decade in California, Washington, Georgia, South Carolina, New Jersey, and Colorado, as well as in other production areas in the world such as Italy, New Zealand, Australia, Argentina, and Chile. Skin discoloration (SD) symptoms appear as brown and black spots or stripes that are restricted to the skin. Abrasion damage in combination with heavy metal comtamination are required for SD development. The damaged skin cells, where the anthocyanin/phenolic pigments are located, collapse and their contents react with heavy metals turning their color dark brown/black. Iron, copper and aluminum are the most deleterious contaminants. Only 5-10 ppm iron is enough to induce SD at the physiological fruit pH (~ 3.5). This contamination can occur within 15-20 days before harvest, during harvesting or at packing operations. 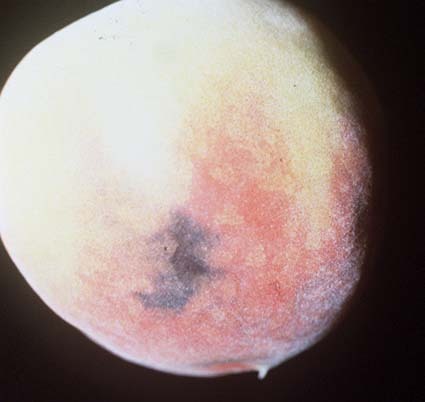 Foliar nutrient, fungicide and insecticide preharvest sprays which contain the above-mentioned metals in combiantion with abrasion damage have the capacity to induce SD on peach and nectarine fruit when sprayed close to harvest. Keep picking containers dirt free. Avoid dust contamination on fruits. Check your water quality for contamination with metals (Fe, Cu & Al). Do not spray foliar nutrients containing Fe, Cu, or Al during fruit maturation. In case of a possible SD high incidence situation with peach and/or nectarine, delay packaging for 48 hours to detect fruit SD damage during the grading operation. As a long term solution, it is suggested that chemical manufacturers attempt to identify and remove the possible sources of contamination from their products that may cause SD before distributing them. Cheng, G. W. and C. H. Crisosto. 1994. Development of dark discoloration on peach and nectarine (Prunus persica L. Batsch) fruit in response to exogenous contamination. J. Amer. Soc. Hort. Sci. 119:529-533. Crisosto, C. H., R. S. Johnson, J. Luza, and K. Day. 1993. Incidence of physical damage on peach and nectarine skin discoloration development: anatomical studies. J. Amer. Soc. Hort. Sci. 118:796-800.